SearchReSearch: Wednesday Search Challenge (2/15/12): Is that a musical instrument? As far as I can tell, the true name of this instrument is the Musical Bow, although I've found it named Mouth Bow, Malunga, Pinaka, and Berimbau. Wikipedia states that, "Cave paintings in southern France dated to around 15,000 BCE, show a bow being used as a musical instrument, so this use certainly has a long history." I found additional information in a book called "The Natural History Of The Musical Bow" by Henry Balfour published in 1899 and found on Google Books. This book suggests that its roots lay in either Central America or Africa (51). I was able to find information on this rather quickly. After watching the video, I noticed a image of folksinger Buffy Ste. Marie (whom I love), so I did a search for (Buffy Ste Marie bow) which led me to a fansite called mouthbow.org From there, it was just a matter of searching for mouth bows. The "mouth bow" or "musical bow" seems to be common in western Africa, but is also played in Appalachia, Brazil, and elsewhere. Pretty sure it's a mouth bow or picking bow. Took me about 5-6 minutes. Google search started broad with "strange instruments" which turned up not much. Then narrowed it to "strange instruments in Africa" seeing that the picture looked it might be played in some sort of tribal region in Africa/Haiti/etc. This again didn't turn up much other than some drums. Tineye'd the picture which returned nothing. Then I finally just googled "instruments played with a mouth and a string" which yielded a video (http://www.youtube.com/watch?v=2p4bDteWfX0) in which I compared the music from the given video to the one I found. Not too hard of a search. i guessed and put "musical instrument mouth bow" into google. "Cave paintings in southern France dated to around 15,000 BCE, show a bow being used as a musical instrument, so this use certainly has a long history." It is said to be one of the oldest stringed instruments in the world, most likely originally made from a hunting bow used as an instrument. Different types are found all over the world so narrowing down a country of origin is difficult - different sources say different things. I can't see your video so I can't tell you anything about that specifically (no YouTube at work). I don't like to generalize and say things came from Africa (a continent, not country) but I don't have a very specific source to quote as to the exact origin of the mouth bow, so I'm going to say generally it likely originated on the continent of Africa. I searched "Large Mouth Harp" in images until I found something like it. That image said it was a mouth bow, so I searched that and didn't get much. I searched it in images and found the image of Mr. Knight. I then did a bit more searching and found more information on the history of the instrument. All told it took maybe 2 minutes to figure out what it was, about 5 minutes to find Mr. Knight's picture and about 15 minutes total. Not too bad, but not the easiest one yet. I'll give it a 6 out of 10 on the difficulty rating. From WP.name: musical bow, mouthbow or mouth bow. Slightly variations on this instrument have many names in different cultures. In general they are known as "musical bows" or "mouth bows". The picture above is actually from this video: http://youtu.be/TS0n81EG2Xw So, given that I would say that particular mouth bow is from Botswana and may be called a "Lengope" (http://www.folkways.si.edu/TrackDetails.aspx?itemid=14193). From what I read, the mouth bow in general originated in Africa. Other names I came across are Berimbau (Brazil), Malunga (India) and Belembao (Guam) to name a few. Method: I searched for "musical instrument looks like a bow and arrow" and a few of the first hits led me to the Berimbau. Wikipedia led me from Berimbau to the entry on "Musical Bow" which had a picture of a guy playing an instrument that looked almost identical. So I searched for "maori musical bow" (based on the caption of that picture) and the 2nd hit was a video. I clicked that link to watch the video to see how similar that instrument was and by chance I noticed the cover image of the suggested video on the right was identical to the image above. Probably the hardest part was that so many cultures have very similar but slightly different variations on this instrument. Overall, I'd say it was reasonably easy, assuming my answer is correct. It is a mouth bow. It's known as a berimbau in Brazil and as a mouth bow in the U.S. It took me about five minutes to look that up. I simply Googled the term "mouth bow" since the bottom picture clearly shows an archery bow used as an instrument. The results helped me get the name, which I had guessed correctly. It's a mouthbow. As for country of origin, that's difficult, as there are cave paintings in France that depict the bow being used as a musical instrument - but most sources I found place the origin of the musical bow in Africa, most likely western Africa. Variations are found throughout the world. Didn't take long - just used a [instrument bow played with mouth] search and several articles on musical bows came up. I found this search really easy after the last few. This was pretty easy for me as I am a fan of Appalachian music and already familiar with this instrument. It is a mouthbow. However, I didn't know the origin. So, I just entered "mouthbow origin". Most state it was introduced from Africa by slaves. I found this one to be very easy. First I want to say that I look forward to Wednesday just to see your challenge. Thank you for making my lunch break more entertaining. I'm a researcher by profession for a television show, and this helps me hone my skills and explore and share new methods with my team. This challenge was harder than I expected! I went down a couple of wrong paths before being sure I was right, in total it took me about 15 minutes. Typed in: "instrument that looks like a bow"
Searched "Musical bow", got to wikipedia page, saw that it's also called a "mouthbow"
Typed that in and looked through images, found Mr. Lee Knight, the man pictured. Win. Wikipedia states that cave paintings in France from 15,000 BCE depict this instrument. France could be considered the country of origin. Berimbau (Mouth Bow) from Brazil. Took about 3 minutes by searching Google Images for some key words and working back that way. Could it be a Berimbau? If it is, I found it with this search query on google: "instrument that looks like a bow"
Well, It is the Berimbau AKA musical bow, AKA mouth bow, aka Appilatian bow. It took me about 10 seconds to find using google search mouth +bow +string musical instrument. Would that be a Berimbau? Took me a while to figure out how to spell that but I saw some guys playing them in the park one day. Pretty cool. It's a mouth bow. It took 15 seconds. I searched for mouth bow instrument! took about 2 minutes to find out and research. searched for "bow over mouth instrument"
its called a mouth bow/picking bow or music flute bow. country of origin dates back to images in caves in france, but mainly from Brazil and Africa. Mouthbow in general. Probably other regional names. Googled "mouth one string instrument" and a YouTube clip with the name is in the first page of results. That was my second query, the first replaced "mouth" with "jaw" and was unfruitful. Total time: 5 minutes. It's called a mouthbow. It took 15 seconds on Google. I searched for mouth bow instrument. I find articles on an Appalachian Mouthbow when I Google "Music played with bow to cheek". Instrument played with bow to cheek brought up the wikipedia article which claims African origin. Roughly 30 seconds. The search was a 4 out of 10 for difficulty, due to the fact that many instruments are played with a musical bow, it's hard to weed out the ones referring to the bow as a weapon repurposed as an instrument. It's similar to the Diddley Bow, which I already knew about. It took about 2 minutes of googling to find it. 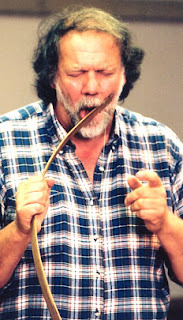 Umrhube, an African bow instrument, which uses the mouth as a resonator. It's a musical bow, primarily found in the Appalachian Mountains, where it is called a mouthbow or mouth bow. Similar to the brazilian Berimbau. its called a picking bow / mouth bow / musical bow. its used alover the world... the berimbau is a similar instrument from brazil which they play during capoeira. 1. to find it, i googled "bow instrument mouth"
2. picked a promising video which was titled "picking bow / mouth bow"
It's called a /khou (where "/" represents a click). "The bow and arrow, as a weapon for hunting, probably was invented about 40,000 years ago. It seems very likely that it was not long after that when hunters discovered they could play tunes on their bows, so the mouth bow as a musical instrument has been found almost everywhere the bow and arrow ever was in use, on every inhabited continent. The San (often called Bushmen) of southern Africa's Kalahari desert call the mouth bow /khou, and the !Kung group raised /khou playing to a fine art. (The / and ! symbols represent click sounds found in their Khoisan language.) Although a hunter stalking animals across the wilds would not hesitate to bang out a tune on his hunting bow, the !Kung entertained each other with specialized musical mouth bows in their encampments – bows that produced a louder, clearer sound than a hunting bow." It's called the Mouthbow. Cave paintings in France date it to 15,000 BCE. The flat-wood variant is known as the Appalachian Mouthbow, and was probably brought to America by African slaves. Googled mouth bow after seeing the picture. Pretty straightforward. Introduced by African slaves to America it is now associated with Appalachian music. I used Google to search. I only included keywords (musical instrument stick string mouth), then I switched to images and it was the first result. I think it is called Malunga or musical bow and is used as a musical instrument and as a weapon. It is unknown if this was their first use. The cave paintings in southern France, dating from around 15,000 adC show a ritual where an arc has been used as a musical instrument. the Malunga, was used by Siddi people of India who are the descendants of immigrants from East Africa. It's a Musical Bow though I've heard it called a Mouth Bow before. Googled Mouth & Bow. Took :02. Just found it. It took me about 3-4 minutes. I just googled "musical instrument wood mouth bow" and looked at the first couple of entries. It is a mouth bow and images dating back 15000 years were found in a cave in France. Searched "String instrument played Mouth africa"
Country of origin: "The San (often called Bushmen) of southern Africa's Kalahari desert"
Mouth Bow. I searched for "mouth resonator, string", clicked on the musical bow wikipedia page, saw similar pics as the ones shown in the challenge. The name mouth bow was used so I did an image search for mouth bow and there was the very same image used in the challenge. I search for mouth resonator because the instrument reminded me of a large jaw harp. But I also searched for "archery bow, musical" and got similar results. This looks like a Chipendani. It's country of origin is South Africa. It's a mouth bow. I lucked out. I searched "mouth bow instrument", because of the man in the plaid shirt with what looks like a bow in his mouth. Proof: http://mommylife.net/archives/2011/12/buffy_sainte-ma.html It's the woman from your video on Sesame Street. Although there seem to be a few different names for this instrument, the most common name across the board seems to be simply a "Mouth Bow". I discovered this by searching "tribal bow instrument" in Google. 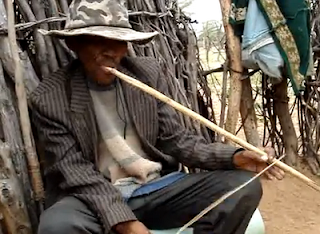 The video described the instrument as "An improvisation on the Umqangala, a Zulu mouthbow"
The origin of the instrument seems to be in debate, but Africa seems to be the consensus. The search took me about 10 minutes total from start to finish. Said to be the oldest stringed instrument in the world, the mouth bow has its origins in Africa, but exists in different versions around the world. Simple in form, a mouth bow consisted of a string (similar to a bow used for hunting or battle) that was placed against the lips. By changing the size and shape of the mouth while striking or plucking the string, the musician was able to change the notes that emerged and produce a melody. In the United States today, a version of the mouth bow is used in the Appalachian Mountain region, where it was believed to have been brought by African slaves during the 19th century. Seems to be a mouth bow or musical bow - The picture of the gentleman in the camo hat is from a youtube video titled "Mouth Bow, African Music, !Xo San, Botswana"
Recognized Buffy St. Marie, 14 seconds into video. Did a Google image search on "buffy st. marie". 9 pages into the results, I found the mouthbow. All in all, the search took less than 30 seconds. Had I not recognized Buffy St. Marie, it would've been harder. Did another search, forgetting that I recognized Buffy St. Marie. Again, a Google image search for: "mouth music instrument wood". There was a musical bow on page 2. Well, it's a mouthbow, of ubiquitous ancient origin. There's not enough detail available in the video to say more, if indeed there is more to say. I searched "single stringed mouth instrument" on Google. Most of the first hits dealt with various mouth harps, which I ruled out, or with modern crafted instruments. The seventh hit had "mouthbow" in the title, so I looked and found a page for Buffy Sainte-Marie, who performed on this instrument in the 1960's. She is also shown in the video, so I took that as adequate confirmation. The biggest difficulty of the search was never getting a full or clear view of the instrument. It does sound interesting, though. Mouth Bow -- It took me about 4 seconds. Searched "jaw harp bow" and it was mentioned in the top 5, then searched "mouth bow" to confirm and brought up the wikipedia page. APPALACHIAN MOUTH BOW... Not so hard to find if you text "bow like instrument" in google images. I hope not to be wrong, greetings from México. I'm pretty sure that's a musical bow. I did a search for "long bow string mouth instrument" and the first article to come up was the wiki for musical bow. Then I did a search for musical bow, and watched some youtube videos to be sure. In Gabon, the Akele call it a ngongo. However, I confess to being from Appalachia, where we call it a mouthbow or a pickin' bow. So I kind of thought that's what it was! I bet a lot of people might mistake it for a jaw harp. This instrument is a Mouth bow. It is hard to tell where it is from because it is very old and its use is spread out all over the world, but some cave paintings of it dating from 15000 years ago have been found in Southern France: http://en.wikipedia.org/wiki/Mouth_bow. It took me less than 5 minutes to find this out. I fist googled words related to what I was seeing on the pictures: "bow mouth instrument" in Google's image search. Once I found the instrument name, I went on Wikipedia to get more info. This seems to be a mouth bow from the Kalahari. My first search, but too easy - it took me less than 2 minutes to figure (by typing in "african mouth instrument" then "mouth bow" and I got the youtube video from which the bottom image is taken.) The other member of our household found it by recognizing Buffy Ste-Marie in the video clip and searching for "Buffy Ste Marie mouth harp". "Ku", of the Maori people of New Zealand. Quick search, 5 minutes, looked for "bow instrument jews harp"; links are there on the first page. Took me about 35 seconds. It is a Bow... and the gentleman on the right is obviously using a instrument constructed the same way as an archery bow. It's a mouth bow. It's found in most ancient civilizations, simply by placing a basic bow (as in a bow and arrow) to your face, and plucking; creating music. I Googled two words: Mouth, and Bow. The two descriptive terms I deemed the most appropriate. I was met with good results including a wikipedia article, and a history channel video. Chipendani from South America. Took about 2 minutes. I searched "african harp whistle". The first listing (http://www.ezakwantu.com/Gallery%20African%20Musical%20Instruments.htm)has something similar 2/3 the page down called an "umquangala". I figured that was about a close as I was going to get, so I stopped there. It is known as a Umrhubhe. The instrument originated in South Africa. I did a search in google images using the actual file from this photo. Then I looked at youtube for related videos and found a comment that said what the instrument is. I then googled the name and found multiple hits for the instrument with pictures and scholarly articles. All of this took less than 5 minutes. The origin is the Ndono, a Masai musical bow from Tanzania. Mouth bow or Picking Bow i think...seems to make sense. Many seems to think that it's affiliated with the Mungiga or Jews Harp. And that it's origininated from the african continent. Looked at the shape of it and how it was built. Just put in Mouth Bow Instrument in google. Not very difficult when you have the world of knowledge at your fingertips. The search took about 10min. I learnt something new though fun excersise! Apparently a mouth bow also known as Obubra in Nigeria. I searched for "mouth bow musical instruments" and the Wikipedia entry came up. Not sure of its origin as it apparently appears on cave paintings 15,000 years old in France and is common throughout the world. Phew, much easier than fixing a towing bracket in a foreign country from far away! It's a mouthbow. The mouthbow is said to be the oldest stringed instrument in the world. It is found in many parts of the world but the origin of it is Africa. It takes 10 minutes to find it. I searched "stringed instruments cheek" in google images and found this guy at page 11. Then I looked at "What is it > Origins" section. It says "It belong to musical bows family ; and precisely of mouthbows" on that page. Finally I searched mouthbows on google. I am going to submit my guess that this instrument is a didgeridoo (my spelling is phonetic, it might not be correct) from Australia. I did not google anything, this is my pure guess, based on the sound of the instrument, and my memory of hearing something like this from my childhood. I took about 3 seconds (or less) to hazard this guess. Not too difficult - but had to think for this one. It took around 10 minutes or less. First tried to find the pictures - but of course they'd been reversed, so no joy here. So I put in a description of the instrument mouth stringed musical instrument / native American musical instruments. Quickly came up with "Mouth bow" that sounded a good description of the pictures / video. So googled images and up came the guy in the check shirt (reversed) so I knew I'd got it. Country of origin is tougher - as Wikipedia says it's now most often associated with the US (Appalachian Mountains). However the the berimbau, a musical bow, is from Brazil, it's also played in Nigeria and there are cave paintings of a musical bow from France 15000 years ago. Umqamgala (musical flute bow). Southern Africa, Tsonga or Zulu. About five minutes. Googled "indigenous instrument looks like a bow". Second result. i think its a "kubing" from the Philippines.